This article explains how to redeem Avios for domestic flights in the United States. With the US being a top tourist destination for Brits, it is worth remembering that Avios can have substantial value when you redeem them for American Airlines or Alaska Airlines domestic flights. The acquisition of Virgin America by Alaska Airlines a couple of years ago has added a lot of new route options. The good news is that there is minimal tax to pay when redeeming for internal US flights. Neither AA or Alaska impose fuel surcharges and there is no US equivalent to the UK’s Air Passenger Duty. For example, a return flight from New York to Boston on American Airlines has just £8 of taxes in Economy. To make your life complicated, however, there are special rules for the pricing of short domestic redemptions in the United States. 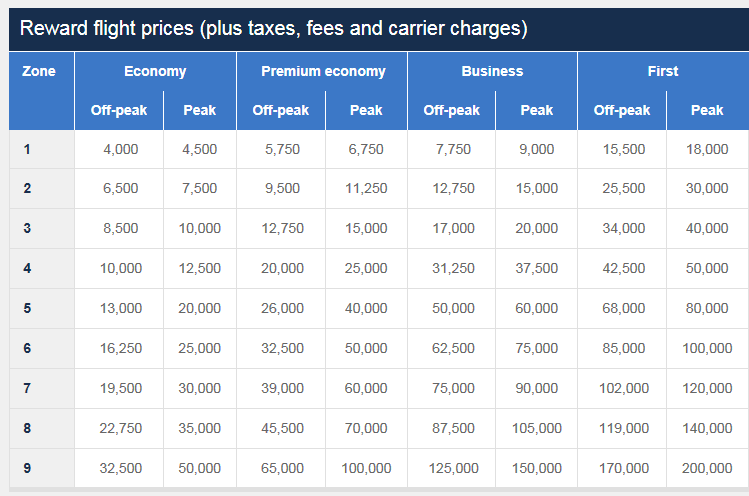 Here is the standard Avios pricing chart – click to enlarge. Note that flights on partner airlines such as American Airlines and Alaska Airlines are ALWAYS priced at peak day rates, whatever day you fly. In 2016, however, Avios introduced a new rules specifically for short domestic US redemptions. Pricing on routes over 650 miles remains the same. One other issue which often crops up when pricing US domestic redemptions is that to get the pricing in the chart above, you must travel non-stop, without a change of plane. If you change planes, you will be charged each flight separately. This can make redemptions very expensive if there is no direct American or Alaska flight to where you want to go, which is often the case. You can also see how many Avios are required for a flight by using the Avios Calculator on ba.com. Remember to look up each flight separately when a connection is required. If you are struggling to find flights from the UK to the Caribbean, you can also take advantage of American Airlines connections to transfer cheaply from the US mainland. Perhaps you could have a ‘city and beach’ holiday instead? When thinking about using your Avios for US flights, you will find the highest number of routes out of the main hub airports. For American Airlines, the main hubs are Dallas, Chicago, New York JFK, Los Angeles and Miami. It also has the ex-US Airways hubs in Philadelphia, Charlotte, Phoenix and Washington National. What baggage allowance do I get? Domestic flights in the US booked with Avios usually come with no baggage allowance if booked in Economy. I wrote more about this here. Annoyingly, you won’t even realise this unless you click the ‘Your Baggage Allowance’ dropdown box during the booking process. It may make more sense to use extra Avios to book Business than pay for a bag in Economy. American Airlines flights can be booked on ba.com without difficulty. If you need to connect, ba.com may struggle to put together a routing so you may find it easier to look up individual flights and then ring BA to book the whole itinerary. Alaska Airlines flights can only be booked by telephone with British Airways Executive Club. A later article in this series will look specifically at Alaska and its routes to Hawaii. I tried booking MIA to MSY on BA’s app (logged in) and it simply said we dont fly this route! Yet AA are the only airline to fly directly. Is this another of the many failings of the BA app?? Can this only be done on the full web site? It is also worth reminding readers that as well as peak pricing, AA call their relative short haul front cabins “First” rather than “Business” even though it is more of a Business class product. So again more Avios down the drain! Recall first paragraph. It works on the website albeit 30,000 Avios each for front cabin but only £7.50 each tax! British Airways does not have traffic rights to operate directly between these two cities. How did you circumvent this error please? I get the same error, and always have done whenever trying to browse domestic USA routes! How are you guys getting britishairways.com to play ball ?! I think this may be an issue with AA availability opening up later than BA (355 days). I tried MIA-BGI for weeks and got the same message. If you leave it maybe 345 / 335 days before departure you may find suddenly seats are widely available. Did someone not post recently that their AA redemption turned out to be basic economy, i.e. only a very small piece of hand luggage allowed (no wheels case) and therefore cancelled? This would Male economy redemptions pretty useless for leisure travellers. Basic Economy on AA and Delta includes carry on (United’s doesn’t). There are 2 categories for “carry on” now though. One is your cabin bag plus small handbag/briefcase. The other is just the handbag (which has got to go under the seat in front, you can’t have overhead locker space). The poster had ended up with the latter option. From the American Airlines webpage. Basic economy: 1 personal item and 1 carry-on. the fact that somebody else wrote X doesn’t make it valid. It’s important to reference the original source (which you can find here: https://www.aa.com/i18n/travel-info/experience/seats/basic-economy.jsp). Probably the other reader didn’t check properly, or not at all! (at the beginning, AA Basic Economy only included personal item and not carry on, but soon after they changed their mind). I seem to remember reading that AA introduced basic economy this way (very restricted) and had to backtrack after a while. Good to know, thanks! I must say I was doubtful that Americans would put up with having their hand luggage allowances curtailed, and it must have been a nightmare to keep tabs on who was trying to get on with what! Yes. I thought what a good idea to redeem Avios for a couple of one-way domestic US flights. After booking, I found very quickly that the flights I booked were in fact Basic Economy. BA let me cancel them without penalty. But I was shocked to be dumped into Basic Economy with no warning. I would love to know how to redeem on Easter Island from Santiago as mentioned above. It’s classed as ‘Long and expensive’ but the cash fares are even worse! 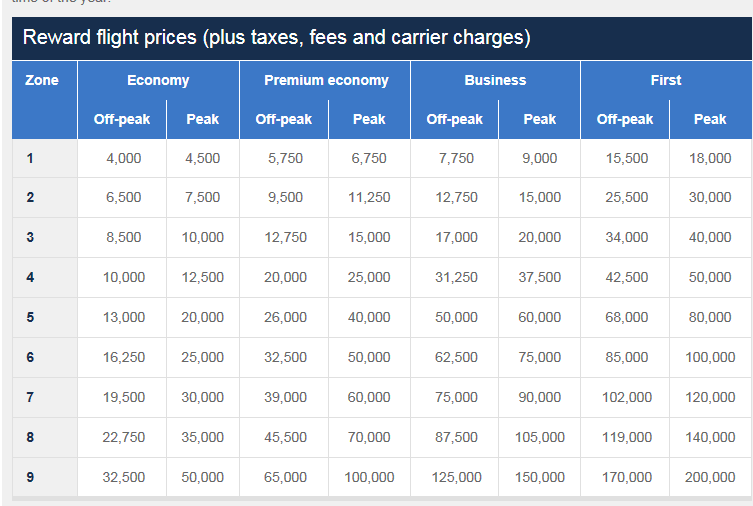 Check business class tickets from Santiago on but on chile LATAM website it quite cheap…. You can book it on BA.com via LATM as we looked at it when we booked into SCL. It’s only available from SCL not Lima and it sells out extremely quickly so book pretty much a year ahead as soon as the flights are released. There’s virtually no award availability to/from Easter Island. You clearly don’t know what you talking about. Easter Island is only served by LATAM, a member of oneworld. Not bookable on United Mileage Plus or Delta Skymiles. Rob’s current value of avios I understand is .01 pence each. He supplied a figure of 25,000 avios (plus any fees ???) for a return economy trip Santiago (SCL) to Easter Island (IPC). That values a return economy trip, without fees,GBP£250 if we accept Rob’s valuation. Or, £254 inc fees and taxes for return economy flights by switching Latam’s website over from UK to Chile. You can’t value something higher than you can buy it for …..
Agree Shoestring and I’d imagine now that there is a minimum 24 month break between amex card bonuses they’l have become more valuable to some. @Shoestring, hardly difficult to value Avios higher than 1p when you are able to buy tons of Avios points at circa 1p each. But yeah… giving a value to points/miles is a difficult/philosophical/creative/ideal-vs-realistic/mathematical challenge. I agree with shoestring, 0.01p per avios is very low 😂 I’ve been going for 0.5p and thought that was quite low. Hey LewisB, I have the route booked for later this year? What do you want to know? Did you manage to get award availability? I don’t mind paying cash but I can’t seem to find anything below £500rt. I’ll be able to book a year in advance, need to book around October when I sort my 241. I’ve tried the LATAM website (local chile site but I only found it to he marginally cheaper. Perhaps I need to keep trying dummy bookings. Since LATAM changed their own FFP earlier this year…. they only offer “Flex Awards to/from Easter Island”. These awards are, however, not available to partners such as BAEC (or any other oneworld partner). I suspect @Neil booked the awards before the changes. I did indeed Lewis.The flight is available each week on Monday’s and Monday’s only. You cannot book the flight 7 weeks out from today’s date. Assuming today is the 2nd of April when you read this then the next available date is the 27th of May. There is always 7 economy & 2 business class seats available. Sounds too simple you say, sadly there is one catch. You must search SCL – PPT. I will leave the decision with you if you want to get out and not continue to PPT. You mentioned a 241. I am flying out to SCL in F and back from SYD in F. Filling the gap in between with SCL – IPT – PPT – AKL – SYD all in J. Moral of the story, listen to no one. Everything and anything is possible with careful planning and organisation. P.s – The PPT flight returns every Tuesday (Same rules above apply). Finding availability for SCL to PPT is no problem. There’s plenty of awards. The problem is only TO/FROM Easter Island. Ditto MIA – JFK. 30,000 avios and £32 for 4 of us. Versus £700 cash fare. Beware the weight of your cases – over 23KG, and you are paying $100 instead of $30. If direct flights are unavailable to book for a companion voucher redemption, is it possible to book a return companion redemption to a hub airport and then call BA to tack on the additional flight legs on say AA to the final destination and have them as a direct connection (with baggage passing directly through)? Obviously both tickets would have to be paid for in full as the companion voucher doesnt cover AA flights. However would one need to pick their baggage up at baggage reclaim and recheck in or are BA able to pass the baggage through direct to the final destination? I ask this as some flights e.g. LHR-MIA (BA) MIA-CUN (AA) are able to be booked via the BA website if paid for, but wondering if this could be recreated via Avios? I don’t know the answer to your question, but be aware that transiting in the US is not simple. Even if your bags can be checked through to a non US destination, you will still have to clear Customs and Immigration. Allow 5 hours to make a connection at MIA, or stay overnight. I travel twice a year on business, on average, and put my miles towards Virgin, so earn no avios from business travel whatsoever. However, I still manage to earn a fair bit of avios from other travel. The occasional jaunt up to Manchester to seem the family, Istanbul, Tenerife, Copenhagen and Lisbon were all flown on BA last year. And yet, I’ve still enough Amex MR and Avios for a business class flight to New York. If you’re savvy with sign up bonuses, and put everything through charge cards, you’d be surprised at just how quickly you can rack up points. A small tip for the best of both worlds with the upcoming Virgin changes. We use both Avios with generally American, and Delta with my SkyTeam KLM miles…..literally fly just about anywhere. I use the Avios and Flying Blue combo. You can get virtually everywhere. FWIW AirFrance are currently running a buy miles up to 75% promotion, eg max 100k + 75 for €2750. Maybe not the world’s best deal, but still cheaper than buying a premium ticket…if you can find the redemption you want. Fred is obviously totally ignorant as to how Avios works and has never taken time out to investigate..ignore. Does anyone have a general sense of whether converting Amex Rewards points to Avios, AA, or Delta points generally offers the best value? I know when I flew LGA to BOS return last September it was definitely available for fewer points with Delta, which, given the 1:1 transfer rate from Amex, made it the clear winner for me on that occasion. But I don’t know if that’s typical. It depends, check route by route… I used 5.000 Skypesos to fly from JFK to SEA. But it’s revenue based… so you have to check route by route. I believe NYC-BOS is also available for 5.000 Skypesos. If anyone is planning ahead to book LAX-HNL on BA (a real bargain imo) I would avoid trying to get Saturday flights. Most days of the week when I was booking for my parents had 7 seats per flight pop up in the middle of the night. But I tracked it and did some dummy bookings before the dates I needed and Saturday flights never seem to be available. Have booked numerous internal US flights on AA using Avios. Keep a close eye on the cash price to see if you’re getting good value for money. As a BA silver, I get 2x baggage included and use of the AA Admirals lounges on internal flights. As Gold, you would get Flagship Lounge access with much better food and drinks offerings. This is one of the benefits of having Oneworld status as most if not all AA Advantage members do not get lounge access on internal US flights (unless flying First) whereas Oneworld Emerald and Sapphires are eligible, even on economy tickets (you also get Main Cabin Extra seats for free). Following on from a few commentators have said about the value of avios, do you have any recommendations how to calculate what sort of slush pot of avios to keep in reserve? BA and Iberia allow you purchase 100,000 a year each program. That’s not a lot for regular biz/F travelers. But transferring too many into avios means you can miss out on other nice things in other programs. Given that the very worst avios can do is to become a defunct product overnight, how do you work out how much you should keep in reserve before diversifying? It’s far more than that – BA and IB both seem to be offering the +50% promotion twice a year, with a 200,000 + 100,000 bonus each time. So you can easily buy 1.2m each pa at little over 1p each. Costing you £12,000 at the extreme end of comfortable stash. I set our own stash requirements at 250,000 as that’s what we burn each year, give or take a few cash tickets (we can’t get 5 Economy flights on Avios so somebody has to get HBO). However, I am much more comfortable having more than 250K in the bank. So you take what you spent the previous year, probably add a bit to cover for inflation and enhancements. Sounds as good a plan as any. I wouldn’t be comfortable buying that amount just to stash in one program. Also we fly to the middle east a lot and with Al Baker’s threats of leaving OneWorld, recently offering generous own airline promotional bonus points and now bringing back the call center, I want a bit more security than all avios. Thanks Shoestring. When you see that BA does not fly that route, go on down to see partner availability (AA).